One snowy day in January of 2005 school was cancelled in Morrisville. 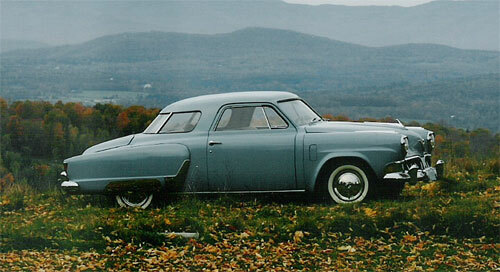 Janet, a first grade teacher in Morrisville, decided to “play” with her Studebaker. It was too cold in the unheated garage to work on the car, so she decided to do a little sleuthing for missing parts for the car and missing parts in its history. Having recently received the build sheet from the Studebaker museum that showed the car was shipped to Detroit Lakes, Minnesota on October 21, 1952, she decided to begin by calling information and getting a number for the Town Clerk’s office in Detroit Lakes, Minnesota. Several very kind people, some interesting twists and turns, and many lucky breaks later she was able to close the circle, learning all of the Studebaker’s owners and everywhere the car has lived in its 53 year old life! Janet and her car will be featured in the upcoming Spring issue of Hemmings Classic Cars, with more about how she was able to crack the “mystery of its history” and a complete restoration article with photographs. October 27, 1952: Car purchased at Lakes Garage, Detroit Lakes, MN, by Immanuel Nielson of Detroit Lakes, MN. for $2548.98. September 10, 1954: Car traded in by Immanuel Nielson. He received $1462.18 against a new two-tone, model 5-H 1954 Studebaker priced at $2812.18. September 10, 1954: Car purchased by Harvey Bakken of Lengby, MN. for $1290.00, less the $900.00 he received for the 1948 green Commander he traded in. 1975: Car sold to Bob Harmon’s junkyard in Lengby, MN. for $50.00. 1977: Car removed from junkyard by Mrs. Harmon’s Uncle Louis Trisler of Des Moines, IA. February 3, 1986: Car purchased by Lawrence Stewart of Indianola, IA from Louis Trisler. October 8, 1989: Car purchased by Brian Tellstone, Richmond, VT, from Lawrence Stewart, for $2900.00, plus $650.00 delivery charge. October 1995: My late husband, Bob, and I went to Richmond, VT to look at Brian Tellstone’s 1951 Black Cherry Studebaker Commander 4-door. I noticed another car in the garage and asked to see it. It was covered and filled with bagged garbage, both inside and out. I asked if that car might be for sale also, he replied he was going through a divorce and everything was for sale. Bob and I went home and discussed the cars. He liked the ’51, I liked the ’52 (being a ’52 model myself). Bob and I decided to make him an offer on both cars. October 14, 1995: Date on the bill of sale; cars were delivered the next day, October 15, 1995. June 1996: Went to Munchy’s car show in the car with Glenn and Joanie Yankee in the back seat. Glenn noticed the arm rest compartments and asked if he could look inside. He discovered myriad letters of correspondence, extra parts and previous invoices. September 21, 1996: Car went to Chelsea, VT to be filmed in the Stranger in the Kingdom movie. October 20, 1996: Car is returned from Chelsea, scratched and missing one hubcap. Car was parked in cattle loafing shed in my hayfield. October 15, 2003: The building the car was housed in blew down in a windstorm, never damaging the car. The car was sent to Dan Spencer’s in Orange, VT to be painted. Paint job was never completed. April 2004: Chrome was taken to ReChrome in PA.
June 2004: Chrome was sent from ReChrome in PA, (unfinished) to NuChrome in MA. July 2004: The car was taken from Orange, VT to Superior Interiors in Hooksett, NH. August 2004: Called Gary Sassi, introduced myself, and asked for advice about my car. September 2004: Had a new garage built to house my cars. September 2004: Completed chrome was picked up by Gary Sassi and me at the Bennington Car Show in the torrential rain. October 2004: Car was brought back from Superior Interiors as Gary Sassi had recommended I have Rene Hargood of Phantom Auto in Knoxville, TN, make a kit for the car’s interior. January 2005: Upon Gary Sassi’s recommendation, I called Gary Scott to ask for advice about what to do with my partially painted car. Gary Scott came to look at it. After getting under the car, he said I had more problems than I was aware of and showed me how the car was rusted out underneath and was about to fall off the frame. To my surprise he said he would be willing to help me fix up the unfinished paint and the structural issues. May 30, 2005: Car was delivered to Gary Scott’s garage in East Barre. He was to have the car three weeks to repair the exterior paint, make patches and repair the structural problems under the car, pull the motor and paint everything under the hood. August 30, 2005: Car was returned to Plainfield. Paint was completed, structural faults repaired and engine and compartment cleaned and painted. In addition, the trunk was sanded and painted, chrome was installed, upholstery was installed, clutch replaced, manifold gaskets replaced, under car greased, and countless other unanticipated items repaired or replaced. September 24, 2005: Car went to Bristol Car Show and won third place in its class, despite the hood release cable coming unhooked and being unable open the hood to show off the newly painted motor! October 15, 2005: Car received the Outstanding Automobile Restoration Award 2005, Stowe, VT.
CONGRATS AGAIN TO JANET FOR HER 2005 RESTORATION OF THE YEAR AWARD!